I have always dreamed of going to Rome, the Eternal City. Rome was the second stop on my birthday trip. There is so much history in Rome, and history was the only subject that I really cared about in school. I have always been so fascinated with Ancient Rome, so being in Rome was a dream come true. 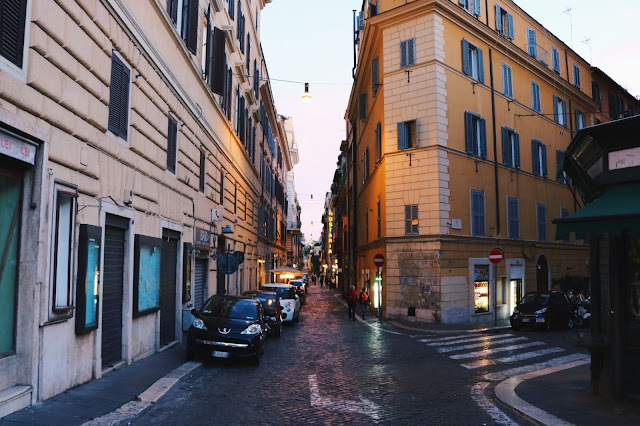 Roma is definitely one of my top 3 favorite places in the world! I took a very short one hour flight from Milan to Rome. The drive into Rome is absolutely magical. The cab driver was pointing out landmarks, such as Palazzo Venezia, and the infamous balcony where Mussolini gave speeches during World War II. 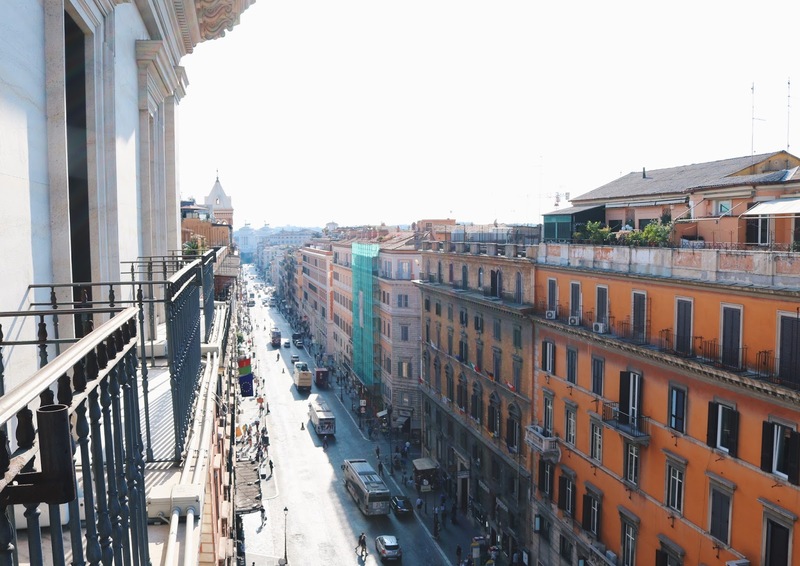 He also mentioned that all of the buildings in Central Rome were at least 200 years old. Most people don't realize how enormous Rome is. I only stayed three and a half days, and I still didn't see everything there is to see. I absolutely loved my hotel, Boscolo Exedra Roma, an Autograph Collection Hotel. Boscolo Exedra Roma is a luxurious five star hotel, that exceeded my expectations. The sumptuous hotel is beyond elegant, flaunting original art and sculptures more than 200 years old on it's 18th Century exterior. The pictures above and below are views from each side of my balcony. I felt like I was in a movie standing on my balcony looking outside. Just like Audrey Hepburn in Roman Holiday. It was late afternoon when I arrived at my hotel. Naturally, I was hungry, and I wanted authentic Italian food. Boscolo Exedra Roma's main restaurant Tazio Restaurant and Bar, has amazing genuine Italian cuisine with the perfect balance between tradition and innovation. The weather was perfect, (not too hot), so I ate on the outdoor terrace that overlooks the gorgeous Fountain of the Naiads. I ordered one the best caesar salad's I've ever had in my entire life, a penne arrabiatta, and a red Merlot. I could seriously eat pasta and drink a glass (or two) of wine in Italy every day for the rest of my life and be happy. The Fountain of the Naiads sits right in front of the Boscolo Exedra Roma. Built in 1880, the fountain sits at the Piazza della Repubblica. The BEST tomato bread I have ever eaten at Tazio Restaurant and Bar. After eating a delicious meal at my hotel, I wanted to explore the streets nearby. One of the things I love about Rome, is that there is a gelato store on every other corner. Similar to Starbucks in the U.S. The gelato in Rome is unbelievable. I will never eat gelato in the states ever again, because it will never taste or satisfy me like the authentic gelato in Italy. The gelato is life-changing! 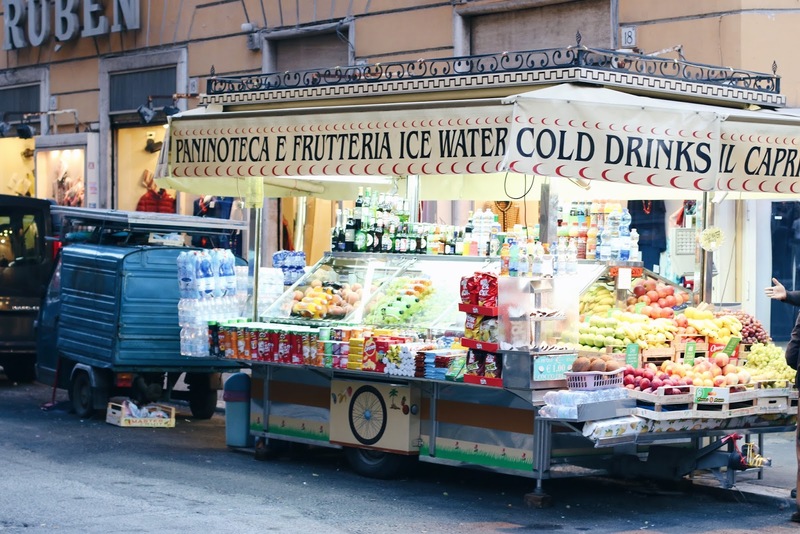 A fresh fruit cart near my hotel. Every alley and street is so photogenic. Dress by Guess, cuff by Kendra Scott, sunglasses by Porsche Design. 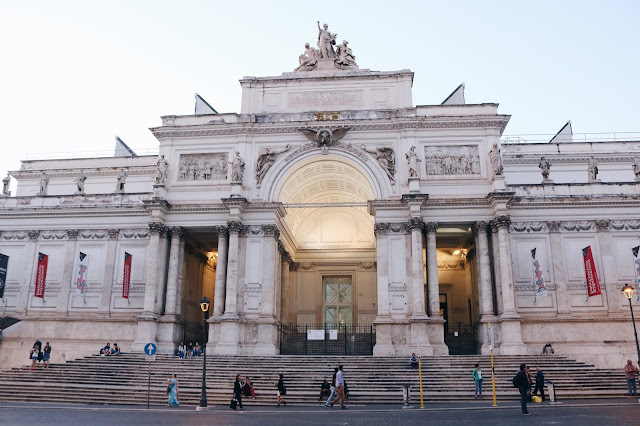 The Palazzo delle Esposizioni is a neoclassical exhibition hall, cultural center and museum on Via Nazionale, just a few blocks from my hotel. On my first full day, I woke up early and went to the first place I think everyone should see at least once in their lifetime - the Colosseum. The Colosseum was built in just ten years between 70-80 AD by over 60,000 slaves, and is the largest amphitheater ever built. It is estimated that the Colosseum could hold up to 50,000 - 80,000 spectors. The Colosseum was used for gladiatorial contests, and public entertainment such as animal hunts, executions, mythological dramas, and even mock sea battles. The Colosseum remains an iconic symbol of Imperial Rome. I am obsessed with the history of the Roman Empire, so being here was a huge and satisfying check off my bucket list. I even wore my Stuart Wetizman gladiator sandals because I wanted to be able to say that I wore gladiator sandals on the same marble ground that real gladiators walked on before they were killed, or killed their opponents. Dress by RahiCali, shoes by Stuart Weitzman. Sunglasses by Dior, necklace by Shashi, bracelets by Gorjana. Fun Fact: The roman numerals above the arches were once painted red and were used as a seating system. Much like the modern day seating system used in venues today. The Colosseum suffers from erosion, and damage caused by earthquakes and other natural disasters. The total amount of marble used for the construction of the Colosseum was estimated at 100,00 cubic meters. The area beneath the Colosseum was called the Hypogeum (meaning underground). The hypogeum consisted of two-level subterranean network of tunnels and 32 animal pens. It had 80 vertical shafts which provided instant access to the arena stage for dangerous animals and scenery. Is is often said that the Ancient Roman's technology was way ahead of their time. This can be determined just by examining the way the Colosseum was built. They were able to fill the arena's stage with water to recreate mock ship battles. Even the roof, or the "Velarium", was retractable, covering 2/3 or the arena, that acted as a ventilation system to catch the wind and create a breeze for spectors. After visiting the Colosseum, It was lunch time. I was told to go to the Spanish Steps, where I could find a ton of restaurants and even better, the main shopping area. The Spanish Steps are a set of beautiful steps that in my opinion, are always covered with tourists. I believe it is nearly impossible to actually get a photo of them without a single soul around. 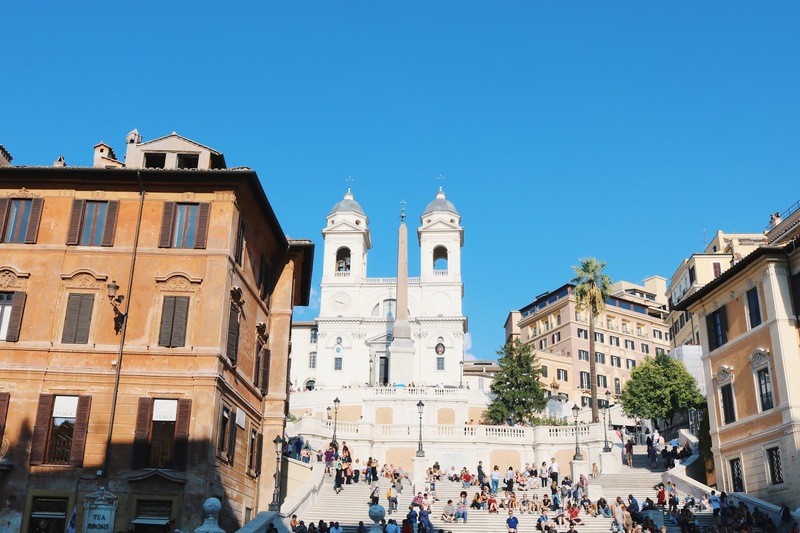 The area surrounding the Spanish Steps is my favorite part of Rome. Every little street has a cute restaurant with outdoor seating. You can find every boutique from Longchamp, to Louis Vuitton, to Gucci, to the original Fendi Roma in this general area. I have never shopped in a cuter area! Fashion Café. So cute, right?! 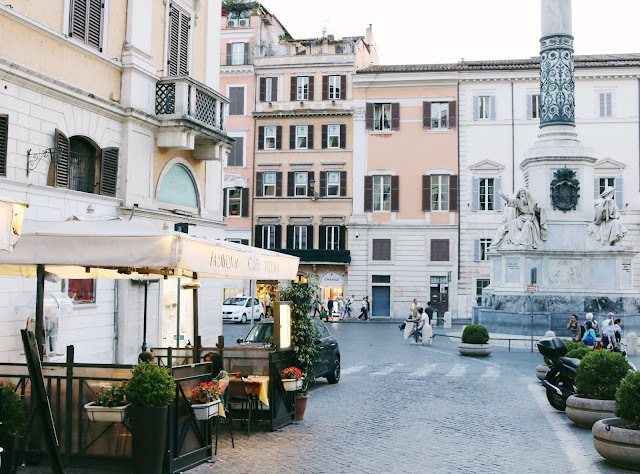 Every restaurant offers outdoor seating on cobblestone streets. Gnocchi is one of my favorite Italian dishes. The gnocchi in Rome is beyond amazing. If you have followed me since day one, you know that I love Valentino, and Valentino is one of my favorite designers. I enjoyed visiting the first Valentino store, and it's headquarters that was conveniently located next to the Spanish Steps. The entrance to Valentino Headquarters. My second night, I went to Zuma Rome. I love Zuma Miami, so when I found out there was one in Rome, I had to visit! 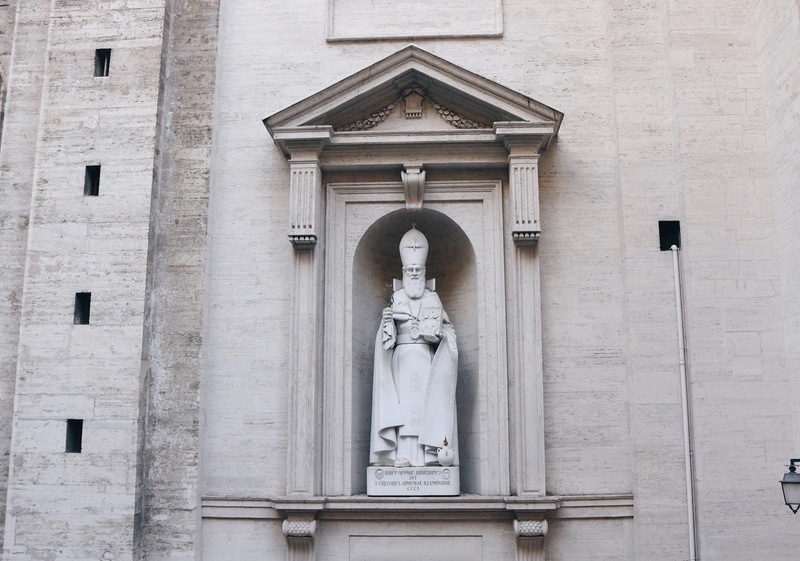 It's located right above Fendi near the Spanish Steps area. When in Rome, I highly recommend eating dinner here. It's a great break from eating all of those Italian carbs! On my third and final full day in Rome, I work up early and visited the Trevi Fountain. The Trevi Fountain was extremely packed with people, it was difficult to take a picture there. It's gorgeous, but I will say, It's a lot more crowded than I had ever imagined it to be. It's definitely not like the movies, where you can just toss a coin behind you and make a wish. You may accidently hit someone with your arm, or be in someone's picture without even knowing it. I almost got sat on just sitting on the fountain's ledge taking a selfie. This was probably my least favorite attraction because of all of the people. Top by WAYF, jeans by Marciano, bag by Christian Louboutin. After taking a few pictures, and eating lunch around the Spanish Steps area again, I headed towards Vatican City. 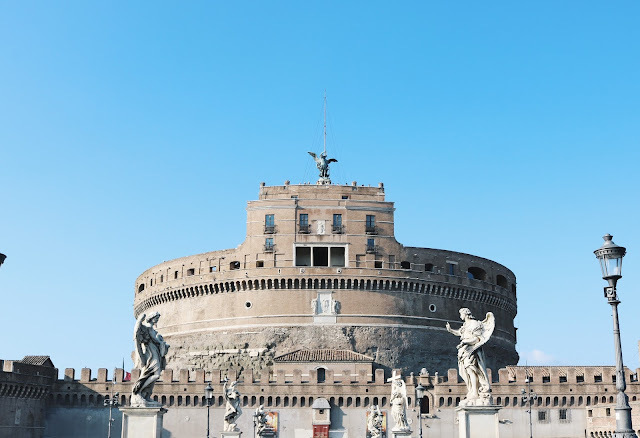 Once inside the border of Vatican City, I stopped by Castel Sant'Angelo, and The Bridge of Angels that graces the main entrance of the castle. The Bridge of Angels, or Ponte Sant'Angeleo. In Rome, everything is spread out. Although you can ultimately walk to each attraction, I recommend taking a cab to most places. I took a cab into Vatican City, since it's a little further away from Central Rome. Vatican City is a city-state surrounded by Rome, and is the headquarters of the Roman Catholic Church. When you think of Vatican City, you automatically think of the Pope. 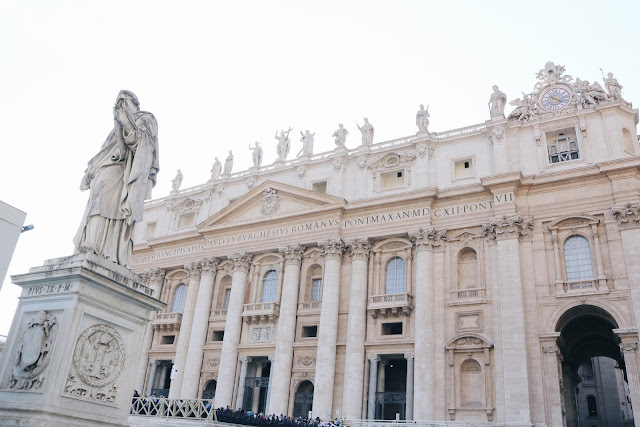 St. Peter's Square is the famous plaza located directly in front of St. Peter's Basilica, where people gather to see and hear Pope Francis, the current and 266th Pope speak. 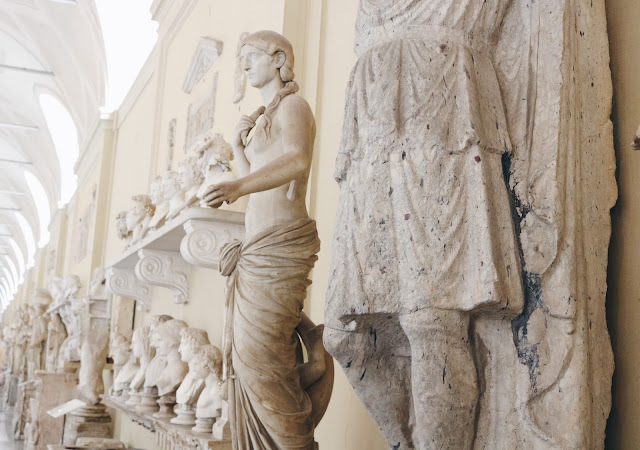 Marble statues and sculptures from Ancient Rome are preserved in the Vatican Museums. A view of the top of St. Peter's Church, or Papal Basilica from the Vatican Museum. 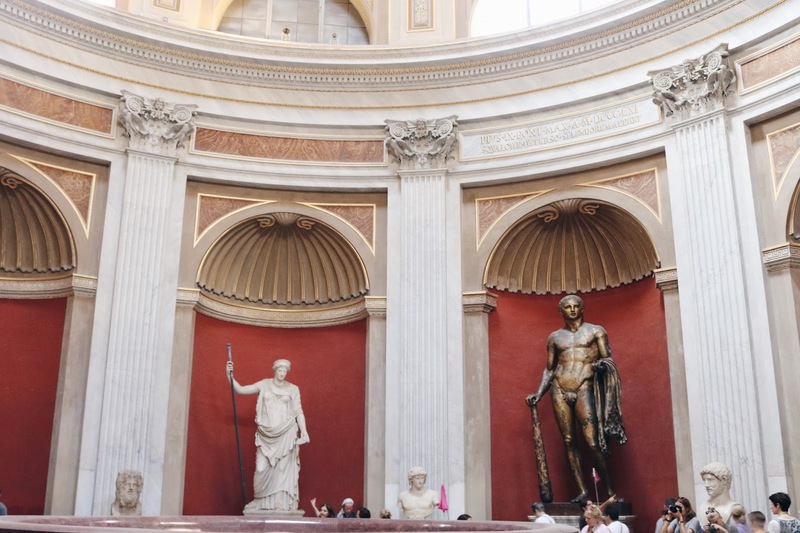 If you visit Vatican City, you must visit the Vatican Museums. If you visit, I highly recommend buying tickets online beforehand due to the long lines there. Like every other tourist attraction, the museums were crowded, but so worth seeing. I was reading online reviews the night before I visited, and people were saying that most people were rushing through each of the museum rooms, because at the very end of the tour is the famous Sistine Chapel. The Gallery of The Maps. "The Last Judgement" is a hand painted alter wall by the Italian Renaissance master, Michelangelo inside the Sistine Chapel. Between 1508 and 1512, under the patronage of Pope Julius II, Michelangelo painted the Sistine Chapel ceiling. He later returned in 1536 to paint "The Last Judgement"on the chapel's alter wall. It took him four years to complete this masterpiece, and it is definitely worth visiting in person. For those who don't know, the Sistine Chapel, is the chapel located inside the Apostolic Palace, the official residence to the Pope. 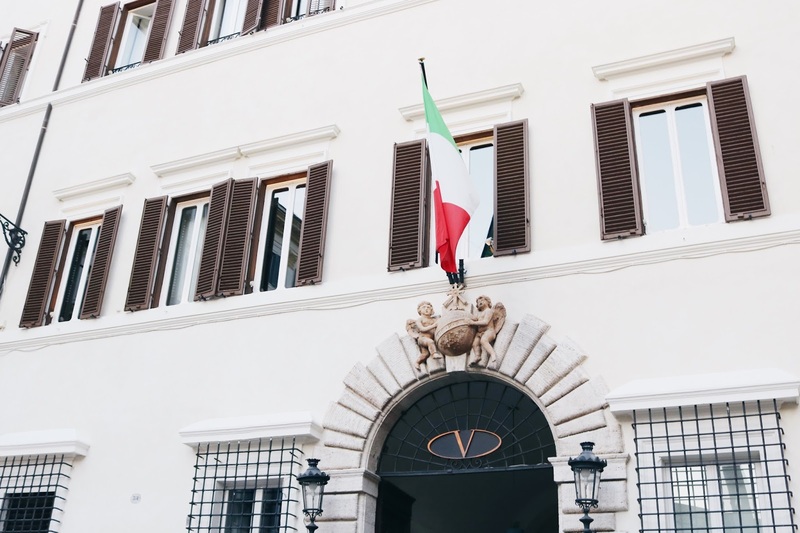 The Apostolic Palace, located in Vatican City, is the official residence of the Pope. I didn't get to see everything there is to see in Rome, but that's a perfect excuse to visit Rome again next year! I really don't need an excuse to go, because the food, history, and fashion is enough to keep me visiting Rome for year's to come! The beautiful Boscolo Exedra Roma at night.